Founded in 1972, CRA’s membership includes more than 200 North American organizations active in computing research: academic departments of computer science, information, and computer engineering, laboratories and centers (industry, government, and academia), and affiliated professional societies (AAAI, ACM, CS-Can/Info-Can, IEEE Computer Society, SIAM, USENIX). CRA ensures that computing research has a vibrant future by investing in our community. With the help of industrial, academic and government leaders, we unite the computing community to advance future directions of the field. We enhance public and policymaker understanding of the importance of computing to make the case for federal investment in research. We have programs that mentor and cultivate individuals in each stage of the pipeline, so that more computing researchers can reach their full potential. All of our programs are evaluated regularly in order to ensure their efficacy. Most of initiatives at CRA are led and supported by our passionate volunteers, talented computing researchers who dedicate their valuable time to bring our programs to life. CRA is an invaluable resource to the computing community. CRA empowers the research community to broaden the scope of computing research and to amplify its impact on society. 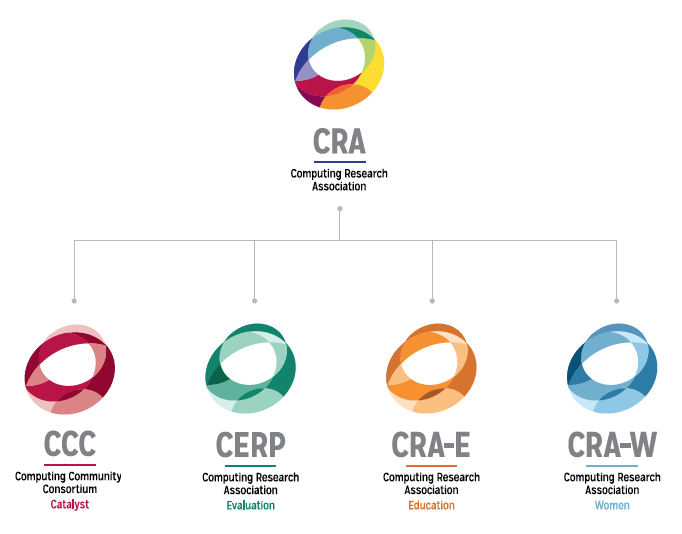 CRA’s Computing Community Consortium (CCC) catalyzes the computing research community and enables the pursuit of innovative, high-impact research. The CCC conducts activities that strengthen the research community, articulate compelling research visions, and align those visions with pressing national and global challenges. CCC communicates the importance of those visions to policymakers, government and industry stakeholders, the public, and the research community itself. The CCC has generated a series of white papers for the White House Office of Science and Technology Policy and other Federal Agencies to help inform National Initiatives, such as Big Data and Sustainability. The CCC leads the community in visioning activities, like the workshop series focused on robotics in 2008. The workshops generated a roadmap of applications for robotics across users, producers, and researchers. In May 2009, the roadmap was published and presented to the Congressional Caucus on Robotics, and subsequently led to the creation of the National Robotics Initiative in 2011, which is jointly sponsored by NSF, USDA, NASA, and NIH. CRA produces resources that standardize and establish best practices in the field. For example, CRA issued a Best Practices Guide for Postdocs, providing guidance to graduate students, postdocs, advisors and mentors, and institutions on how to develop positive postdoctoral experiences within computer science and engineering. CRA members benefit a great deal from interacting with academic and industrial colleagues. The biennial CRA Conference at Snowbird is our flagship conference where leadership of computing research departments gathers to network and discuss common issues concerning the future of the field. CRA is a trusted source of information—formally and informally—for Members of Congress and their staff, as well as the White House and the President’s Council of Advisors for Science and Technology. CRA assists policymakers who seek to understand the issues confronting the federal Networking and Information Technology Research and Development program (NITRD)—the thirteen-agency, nearly $4-billion-a-year federal effort to support computing research. CRA helps educate Members of Congress and the Administration about the benefits of the federal investment in computing research. CRA-sponsored briefings have “deconstructed” the iPad for Congress (to detail the legacy of Federal investment in the development of the key enabling technologies in the device), highlighted key research areas in the field, and brought Members of Congress and their staff into direct contact with the technologies that are impacting every aspect of our lives. CRA also helps provide policymakers with expert testimony on issues that affect science policy generally and computing research policy in particular. CRA Board Members have testified before House and Senate committees about the importance of computing research, cyber security research, and the payoff of the Federal investment in science. Members of the CRA community also sit on agency and presidential advisory boards and serve at agencies across the Federal government, playing key roles in managing the Federal portfolio in computing research. CRA and CCC also help develop the computing community’s next generation of leaders through efforts such as the Leadership in Science Policy Institute, a 1.5 day, DC-based workshop with the goal of increasing the community’s understanding of the policymaking process. Participants get an intensive education from policymakers in the White House, the agencies, and Congress about how decisions affecting science policy actually get made, and what role those participants could play in that process. CRA cultivates talented computing researchers at each stage of their careers. CRA’s programs help undergraduate students, graduate students, postdocs, early career, and mid-career professionals develop valuable skills that prepare them to achieve success throughout their research careers. CRA’s Committee on the Status of Women in Computing Research (CRA-W) programs focus on reaching women at all career levels to diversify the talent pool in computer science and engineering research and education at all levels. CRA-W works with other broadening participation in computing partners to more effectively reach underrepresented minorities. In 2003, CRA-W was awarded a Presidential Award for Excellence in Science, Mathematics, and Engineering Mentoring, and in 2005 the National Science Board’s Public Service Award for their work in addressing the underrepresentation of women in computer science and engineering. CRA-W coordinates a range of effective mentoring programs and workshops designed to increase the representation and opportunities for women and minorities in computing research. Some of their initiatives are below. CRA analyzes the health of the computer science research talent pool and evaluates the effectiveness of intervention programs intended to grow this pool by surveying, comparing, and analyzing computing departments and individuals.